Sunday morning the family came over for Easter Brunch. We weren’t a big crowd, health but there was enough food to feed a small army. I made those Baked Eggs with Chorizo and Gruyere I posted on Friday, cialis 40mg little tarts with vanilla honey goat cheese and raspberries, ascariasis and this Skillet Lemon Almond Tart. My mom brought a huge basket of breads and muffins, coconut bars and other assorted goodies. My mother-in-law brought fruit salad with orange-scented yogurt and cinnamon buns. And of course, the guamosas were flowing. After brunch, I thought I’d never be able to eat again. But that didn’t stop me from snacking on leftover cinnamon buns, fruit, cheese and salami later that night. And about that tart, when I saw this recipe in the New York Times months ago I knew it would be wonderful. It’s full of things I just love: butter, almonds and lemon. I added one more thing I love: cardamom. This tart is perfect for the non-baker because it lessens the usually complex and tedious tasks of baking – weighing, measuring and leveling – down to something as simple as mixing together a frittata. 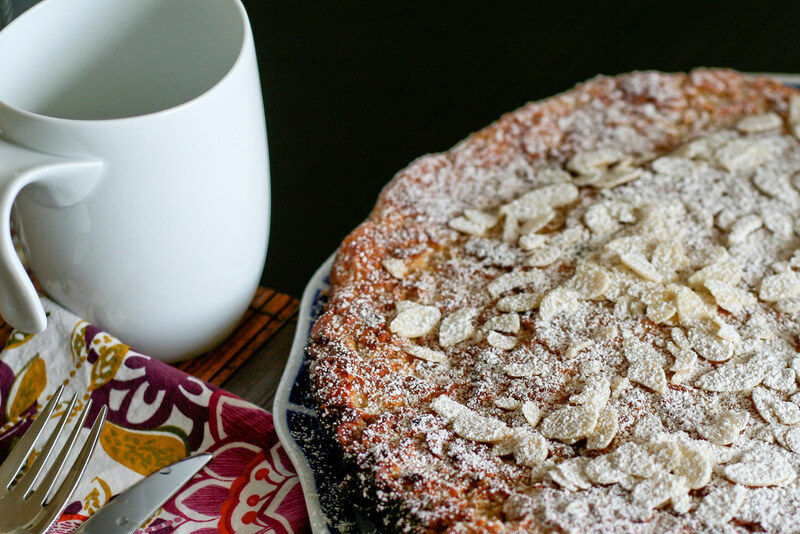 Because this dessert is essentially just that – a sweet, almondy, lemony frittata. The most perfect accompaniment to a steaming cup of coffee with real cream. I recommend you make one as soon as possible. Adapted from Mark Bittman’s Pan-Baked Lemon-Almond Tart. Preheat the oven to 400° and set a 10 – 12 inch skillet over low heat (about 3 on the dial). In a large bowl, whisk together all of the ingredients except for the butter and powdered sugar. Melt the butter in the pan. Once it stops bubbling, pour the batter into the skillet. Continue to cook on low heat until the eggs are just set. Carefully transfer the skillet to the oven and cook for another 15 minutes, or until the eggs are totally set and the edges are browned. Remove from heat and let cool before transferring to a serving dish. 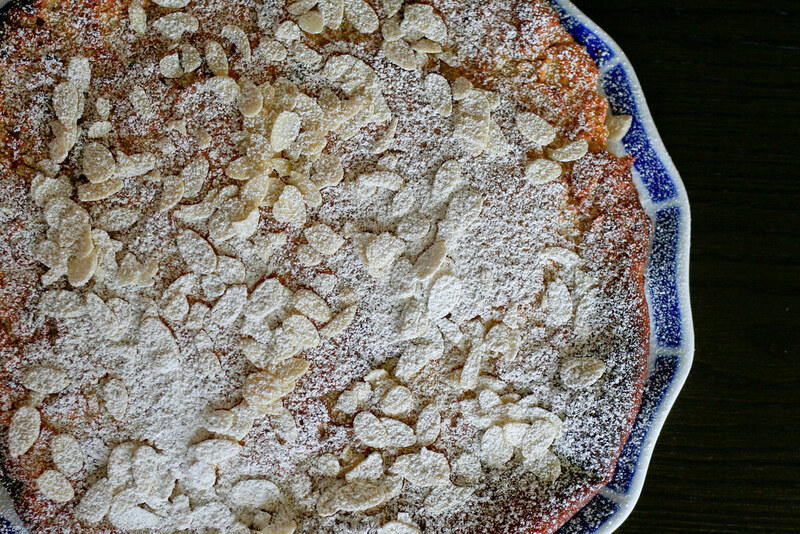 Sprinkle with extra slivered almonds and dust with powdered sugar. Makes about 10 – 12 servings. So if it’s a frittata….I can have it for breakfast, lunch, AND dinner. Right? Love that you added the cardamom. It definitely adds a nice touch. This is lovely! I love this recipe of tart, i run through the ingredients, and all of them was nice and will definitely complement each to create a harmonious sumptuous taste! If this is a perfect match for coffee, of course this is great! Thank you for sharing your recipe! Mmmm I like the sound of this… perfect for so many occasions! Lovely!!! Sounds like a clafouti. And the addition of cardamom — YUM! This comment has nothing to do with this blog. I just came across your blog and I must say I am already a huge fan and I have only skimmed through it. I love Camaros and I love cooking, I am also a photographer and love to photograph food and your pics are awesome. But what caught my attention the most is the name of your blog cause I love the song “Bitchin Camaro” by the Dead Milk Men. Keep up the good work, I have added you to the list blogs I keep up with can’t wait to dive into some of your recipes. Perfect! Baked goods for the non-baker like me. This is definitely going on my list of desserts to try. Your blog is a pleasure to read and your photographs are gorgeous. Would you mind telling a novice cook/baker how one would grind almonds? I did Google the term, but didn’t know (for this recipe) if I wanted an almond flour or meal texture. WOW! This is the most amazing dish I’ve ever made. Seriously. Thank you for posting and I look forward to trying many more of your concoctions!